Delhi is prominently called as National Capital Territory of India that hallmarks the golden era of Mughal empire. It is one of the cities that comes under the category of India’s Golden Triangle apart from Agra and Jaipur. Large number of domestic as well as international travelers visit this place every year to visit different types of monuments ranging from mosques, temples, old heritage buildings and much more. Due to this reason, we are here to offer you this Delhi Travel Guide that contains all the required information that will help you in visiting all the prominent tourist attractions very easily. Have a look at the below mentioned famous tourist places in Delhi or places to visit in Delhi that are must visit places and form an integral part of Delhi Tourism. Red Fort is also famously called as “Lal Quila” and regarded as one of the best architectural monumentsmade during the Mughal era. It has derived this name from the red-sandstone walls and was built in the year 1638. This magnificent Fort is a must visit place for every tourist coming to Delhi from any part of the world. Red Fort comes under the category of “UNESCO World Heritage Site” and every year on 15th August (Independence Day) the prime minister of India hoist the flag from this great monument. It has become an iconic symbol of India and attracts tourist from all around the globe. *Please note- Red Fort remains closed on Mondays. Humayun’s Tomb was built between the period 1562 – 1570, which was commissioned by Bega Begum, first wife of Mughal emperor Humayun. This tomb is located near the shrine of Nizamuddin Auliya Chisti, a sufi saint on the bank of river Yamuna. It was designed by Mirak Mirza Ghiyas, Persian artist and in 1993 it was declared as “UNESCO World Heritage Site”. This great Mughal architectural symbol has Persian style of gardens and considered as the first garden-tomb of India. 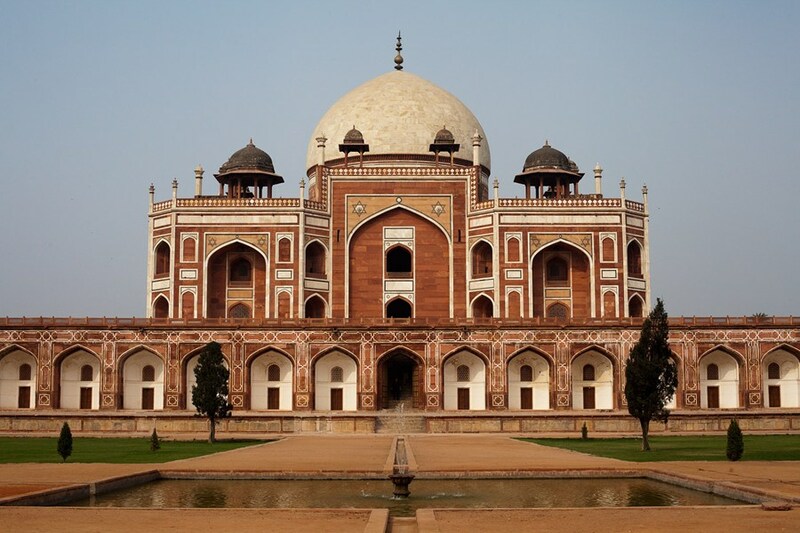 Humayun’s Tomb is a must visit place for every tourist coming to Delhi from any part of the world. 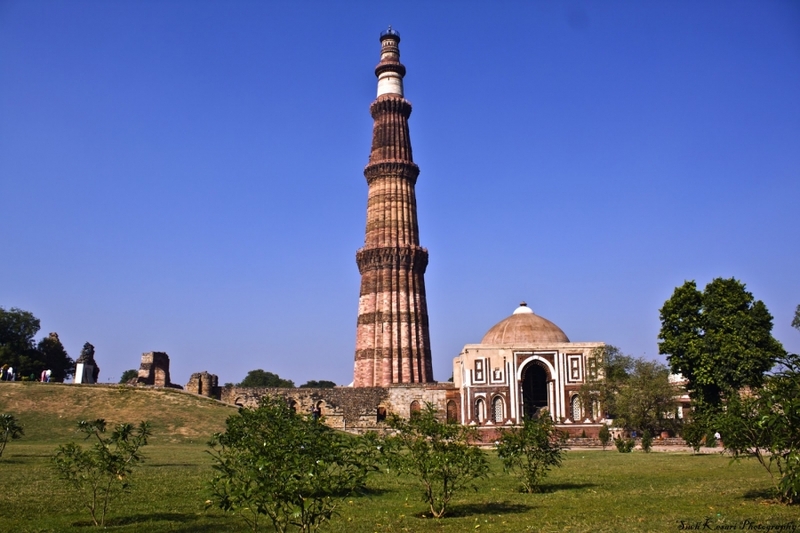 Qutub Minar was constructed by Qutab-ud-din Aibak in the year 1193 that has height of 73 meters and called as tower of victory or Minar. This highly decorated monument was also declared as “UNESCO World Heritage Site”. It is surrounded by various ancient structures, medieval ruins that are jointly known as Qutub complex. The minar is covered with beautiful verses from the Holy Quran along with intricate carvings on the red-sandstone. Large number of domestic as well as international visitors visit this famous tourist attraction every year. 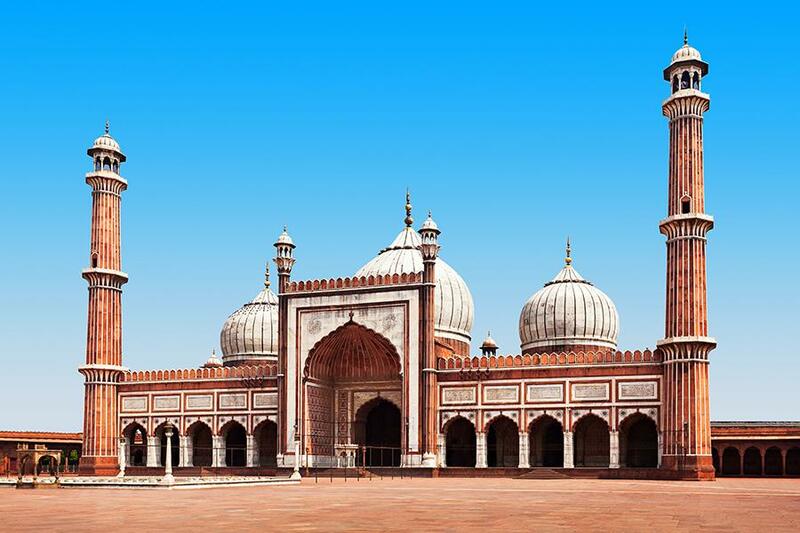 Jama Masjid is famously called as Masjid-i Jahan-Numa and considered one of the famous mosque in India. This historic and beautiful monument consists of two 40 meter high minarets, 3 gates and 4 towers made in red-sandstone as well as white marble. In this mosque, around 25000 people can offer prayer at a single point of time. Large number of tourists from different parts of the world visit this place every year. It is great example of Mughal architecture that was constructed between 1650 to 1656. 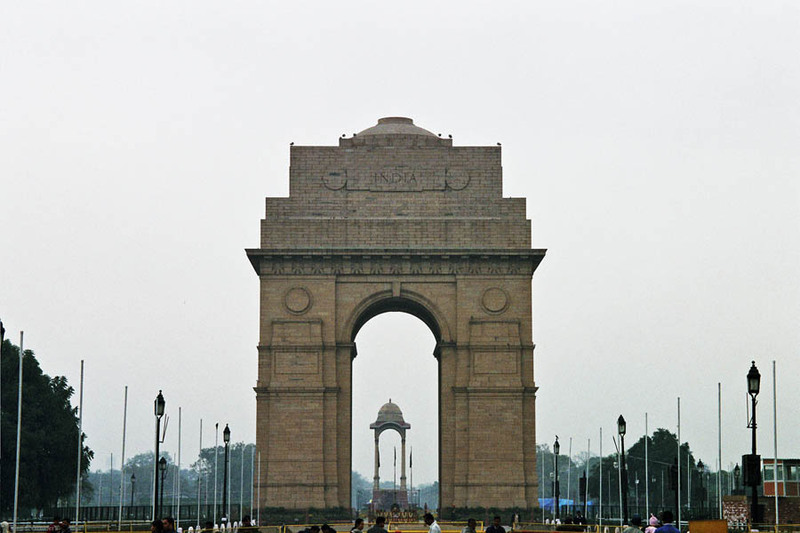 This monument is a must visit location in Delhi and needs to be included in your Delhi tour. Chandni Chowk is one of the oldest and busiest markets located in Old Delhi and means Moonlit Square. Having a rickshaw ride in the bustling bazaars of this market is a great experience for every tourist coming to Delhi from different parts of the world. At the same, it is possible to tour the nearby Khari Baoli spice market that is famous for different kinds of spices. 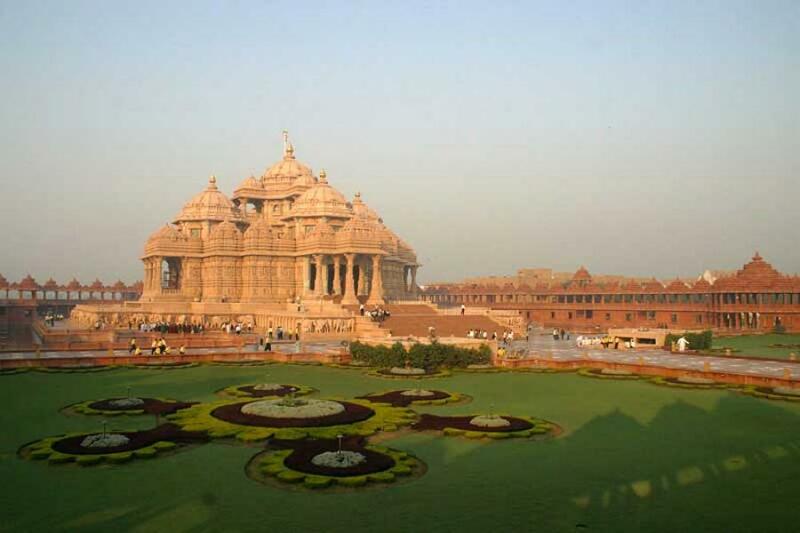 Akshardham Temple is the largest Hindu temple in the world, which was constructed in the year 2005. This wonderfully carved monument comprises of gardens, food court, a musical fountain, an IMAX theatre and has different types of exhibitions on regular basis. *Please note- Akshardham Temple remains closed on Mondays. 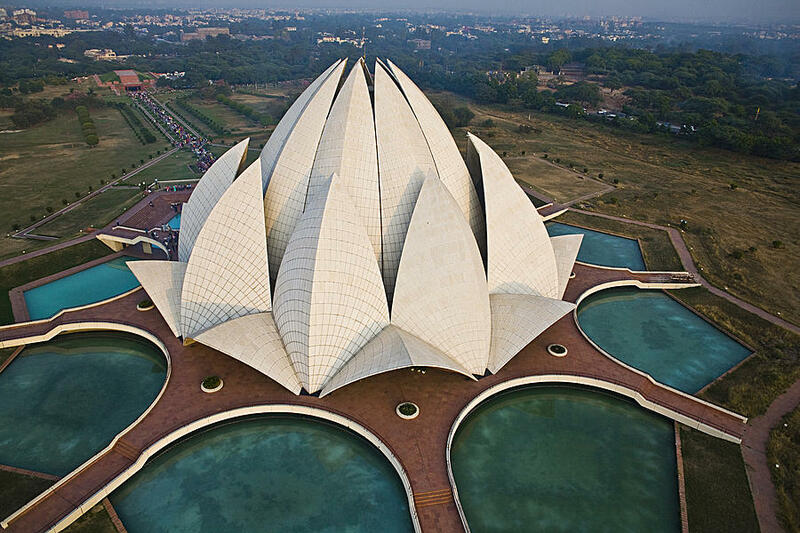 The Lotus Temple is one of the most famous temples of Bahai house of worship, it has lotus flowerlike shape that makes it is very famous all across the globe. The best thing about this temple is open for people of every religion and caste. *Please note- Lotus Temple remains closed on Mondays. India Gate is a famed memorial situated in Delhi that was constructed to honor the Indian soldiers who died in Afgan wars and World War 1. It is a prominent tourist place, where on the walls you can see the names of the martyr soldiers. It is considered as the most convenient and appropriate way to reach this city. Delhi is very-well connected with all the major Indian cities Mumbai, Bangalore, Chennai, Cochin and Hyderabad. It has domestic and international terminal for large number of flights to various destinations on regular basis. You can get connecting flights to major international destinations from Delhi, which makes your journey much comfortable. Delhi is very well connected with all the major cities like Mumbai, Bangalore, Kolkata and many more. You can reach this place by taking trains from all the major cities of India. Traveling in train is a wonderful experience and will surely make your trip to Delhi is perfect in all respect. Delhi is very well connected with all the major Indian cities and has a vast network of roads. To make your ride comfortable and to visit all the tourist attractions in and around Delhi, you must hire a car rental service.